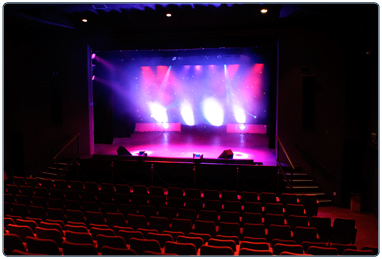 The Village Theatre is available for hire for both community and professional groups and caters for everything from 1 man shows to large musical productions. Enquiries can be made via email or by contacting the box office. The Theatre also has a rehearsal room available for hire during the day and occasionally for functions during the evening. The Village Theatre also provides a licensed bar for all professional performances and amateur productions, opening 30 minutes before the performance, at the interval and at the end of the performance by request. We currently offer a tiered pricing structure based on your requirements, and are able to provide everything you may require to stage a successful production, from technical staff and stewards to use of the grand piano and UV Cannons. A full price list is available on request, and we will be happy to offer our expertise in ensuring the smooth running of your production. To enquire about this venue with no obligation to book, please complete the Venue enquiry form. Alternatively, please contact the Village Theatre East Kilbride. This table contains information on the capacity of the rooms and halls at The Village Theatre, East Kilbride. Access: Disabled access to auditorium via front entrance. Auditorium can accommodate 2 wheelchairs.